My friend Don reserved and prepaid a room at a Portland airport hotel through Priceline, but his cross-country flight was delayed, and when he finally arrived after midnight, the desk clerk told him the hotel had no rooms available. Even after Don showed paperwork proving he had prepaid in full, the clerk repeated that there were “no rooms.” Instead, the clerk offered the unofficial remedy of “walking” an oversold guest to another hotel and paying for the night at that hotel. The first hotel also claimed that it would authorize Priceline to refund the room cost—which hasn’t happened yet but probably will. And when Don continued to complain, the clerk offered him a preprinted form letter offering a “free” future room. The hotel that Don was offered was, in his words, a “dump,” rated one star by Priceline compared with three and a half stars for the first hotel. After arriving at this dump, Don phoned the Sheraton to complain again. The clerk told him that if he could find a room at a better hotel, the Sheraton would pay for it. But by that time Don was so tired he decided not to prolong the problem and to stay. That’s where the incident ended. And it brings up some important points about hotel reservations. 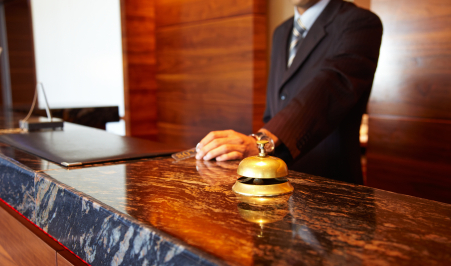 Hotels overbook for the same reason airlines do: to compensate for the inevitable number of travelers who fail to show up for “confirmed” reservations for one reason or another, or those who check out early. As long as the hotel can accurately predict those numbers, nobody gets hurt. In fact, by making more rooms available for advance sale, overbooking can actually benefit consumers. But hotels occasionally miss their prediction. Moreover, hotels may decide to double sell a supposedly “guaranteed,” prepaid reservation if the guest hasn’t arrived by a very late hour and someone walks in looking for a room. When that happens to you, the hotel cannot and will not honor the reservation. Just as an airline can’t put an extra seat in an airplane, a hotel can’t quickly add a room or two. No matter what the situation, you won’t get the room you expected. Unlike the case of airline bookings, where DOT mandates rights for airline passengers, oversold hotel guests have no specific rights. Instead, your right is strictly a matter of contract law: Your reservation is a contract that the hotel is unable to fill. In those cases, what the Sheraton did with Don is more or less standard industry practice: The hotel “walks” you to another hotel of “equal or better” quality and picks up the cost of your first night there. You don’t literally have to walk, and unless you have a car or the replacement hotel is next door or across the street, the first hotel is supposed to pick up cab fare. Although I’ve seen reports stating or implying that “walking” is an enforceable legal requirement, I haven’t been able to locate any such specific laws or regulations. Nor have I been able to find any hotel contracts posted online—for either individual units or chains—that detail hotel obligations, as is required for airlines. Instead, although walking seems to be an industry practice, at best it’s “typical” or “common” and certainly not universal. Walking might seem reasonable, but it does not, in the words of tort law, “make you whole.” Even when a hotel does walk you, the substitute hotel may not be an adequate alternative. Every time I’ve been walked, my experience paralleled Don’s: The substitute hotel was of a significantly lower quality. I’ve heard from readers of cases where a downtown hotel offered a substitute room in a remote suburban location. Accept the hotel’s fix if it’s at all reasonable. If the offer falls significantly short of your expectation, ask for some extra compensation or try to find an alternative yourself and ask the hotel to arrange it. In the worst case, pay for your own alternative and submit a formal complaint—and possible small claims court suit—after you return home.